Hi again, it's my Dad's birthday in a couple of days. He loves fishing and goes on trips with a mate in their little boat. This is my attempt at paper tole! I've cut and layered the boat and the rope to try and make them stand out more. I think I need to use thicker foam tape. Virginia's View Challenge, a new challenge for me, where the theme is watercolor. I'm also linking up again to Addicted to Stamps where the theme is anything goes. Inktense pencils; Divine Swirls embossing folder; Sentiment sticker. So beautiful, I love the way you have 'framed' the watercolored piece! Fabulous card, I love your embossed 'waves'. Sometimes I use two layers of foam tape, if it's a bit thin. WOW! Watercolour perfection :) Thank you so much for sharing with us this week at Addicted to Stamps and More, we sure hope to see you around again soon!!! So fabulous how the colors pop against the black! Looks like a framed painting! Perfect entry for the water-coloring challenge! Love your artistic approach! So glad that you found out about this new challenge blog! Thanks SO much for linking to Virginia's View Challenge! This is such a pretty scene! Love the 3D look of the boat bobbing in the water! You can totally tell the boat and the rope are popped out. I noticed it as soon as I saw your card. I assumed you were just that much of a whiz at coloring and shading to give it depth. 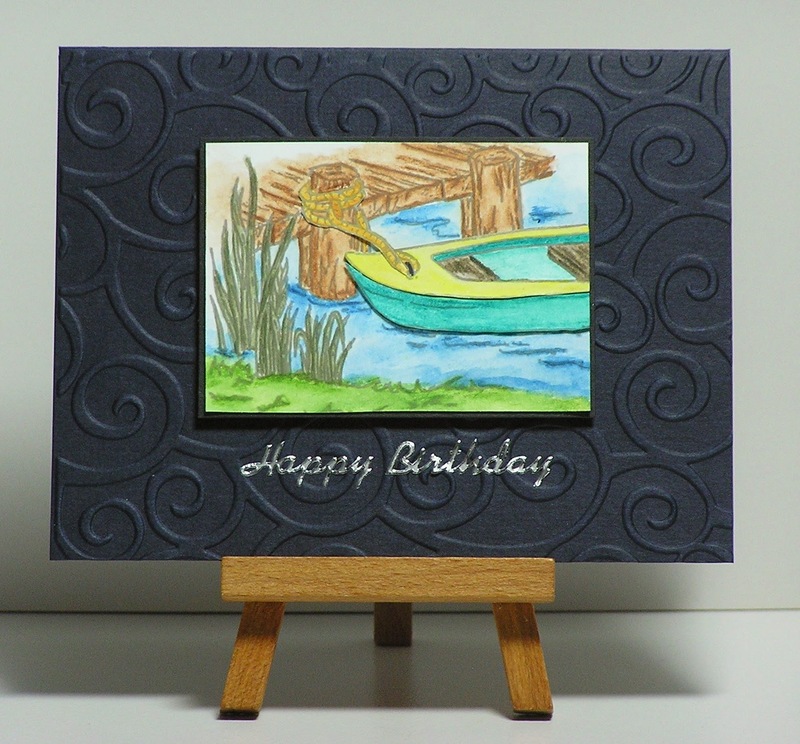 It is a great card and I love the swirly background as it gives the feel of waves.